What if you could get the best USB microphone under 100 dollars? At that price, just imagine how much you'll save and still get a microphone for rapping, podcasting, or gaming that can deliver excellent audio quality. Now if that's what you look forward to, we've got you covered in our guide to the best USB recording microphone under 100. These are easy-to-use universal USB mics that are compatible with both Windows PC and MAC operating systems as well as Laptop, iPad, and smartphones, so you don't have compatibility issues to deal with. Although you don't have to rob a bank to purchase them, our selections are based on those that have a high number of positive user reviews as well as ratings on Amazon, eBay, and Walmart. Whether you're a YouTube publisher, Vlogger, or rapper, you can find one that meets your needs at an affordable price. Why Should You Buy a USB Mic? You may be wondering, what is a USB Microphone? A Universal Serial Bus microphone is an audio equipment that amplifies sound using a microphone and single-channel USB audio interface. For this reason, you will not need a separate audio interface, preamp, and a microphone before recording with a PC, Mac, iPad, Tablet, or smartphones. 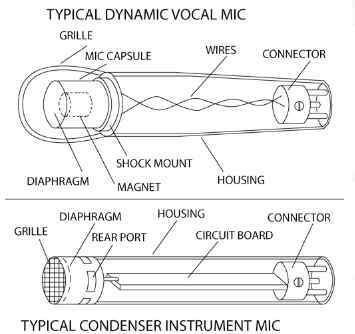 Like conventional microphones, it also comes with a diaphragm, transducer etc. to enable it to pick up a sound and amplify it. The one of the differences between a USB mic and a conventional mic is that the former comes with two other circuits which are the preamp and an analog-to-digital (A/D) converter. The inbuilt preamp in this device takes away the need to connect to a mixer or an external mic preamp. Its analog-to-digital converter (DAC) switches the mic's output from the analog to digital which makes it possible to plug directly to a computer and read the DAW software. This is because audio is processed and digitized through the microphone instead of being sent as a signal first through an XLR cable to the computer as is the case of a professional mic. All you have to do to use a USB microphone with a PC or laptop is to plug in the mic, access your recording software, and then begin to record. After recording, you can either playback the sound through the computer or from a headset. A USB mic takes advantage of the computer's inbuilt sound card to playback sound and as such, you don't need to buy an extra sound card for it before you can use it. Even without the sound card, you can plug in an open back headphone into its headphone output which will enable you to directly monitor the mic input and pre-recorded tracks on one ear. There are two major types of USB microphones and each describes its mode of operation. That is, how the transducer in the mic picks up a sound and then transforms it into electrical energy and in each case, this is done differently. You'll find dynamic and condenser USB microphones as the two major types. A dynamic USB microphone can handle high sound levels. These are inexpensive microphones that are not very sensitive to sound coming from different directions due to the rugged build of their magnet and coil. Therefore, they may not pick up background noise easily and may be unaffected by extreme temperatures or pressures. For this reason, they are most suited for being used outdoors, noisy places, live recording environments or if the speaker will tend to move frequently. This type of mics can either be powered by batteries or phantom power. They are recommended for vocal music, podcasting and several other situations where only the voice of the speaker needs to be amplified. Due to the nature of their build, they have an enhanced sensitivity and frequency response. They can pick up even faint sound which makes them more suitable for acoustic recordings that require high fidelity audio. They can pick up sound in the background which may be undesirable and even re-amplify the sound produced by the mic itself. That being the case, they are more suited for use in the studio or environments where there is no noise. The decision on which to settle for is left for you to make since each is best suited for the physical settings it will be used in. 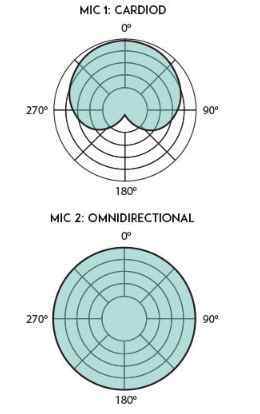 A polar pattern of a microphone describes the way it picks up a sound and it is determined by the three-dimensional area around the diaphragm where it is most sensitive to sound. The major types of polar patterns are the directional or cardioid and omnidirectional polar patterns. An omnidirectional microphone is sensitive to sound coming from all directions, therefore, it can pick up sound easily. Given its 360-degree radius directionality, it is suitable for studio recordings and recording acoustic instruments such as guitars because irrespective of where the mic faces, the sound will still be picked up. Settling for an omnidirectional USB recording microphone also means that it will be able to pick up background sound as well. In that case, if you want a mic for jamming with your band or conducting an online meeting in a single location, this would be it. In a directional microphone polar pattern, the diaphragm is only sensitive to sound waves coming from certain directions. As a consequence, the mic's diaphragm can fully detect sound coming directly in front, minimally sensitive when it comes from the sides, and then unresponsive when the sound comes from the back of the mic. Given the nature of their diaphragm, they tend to block out background noise such as one created by the computer fan. A cardioid USB microphone is best suited for recording sound when the subject is directly in front of the mic. They are also suited for music production and live sound reinforcement, unlike omnidirectional microphones. Whichever you settle with will be determined by the purpose its supposed to serve since there is no clear winner. We've taken time to explain the types of USB mics as well as their polar patterns since these manufacturers combine both to build their device. Consequently, you'll find a condenser cardioid USB mic, a condenser omnidirectional USB mic, an even a dynamic omnidirectional mic. Unarguably, some mics like the wireless lavalier microphones, handheld or shotgun mics can perform better than these USB mics. You may be wondering why you should buy a USB microphone or if USB microphones are good for recording music given the great capabilities of the already listed devices. These are inexpensive microphones compared to conventional mics or other types of microphones. You don't even have to buy an extra kit to set them up. Thus, they can be your goto microphone for live streaming games and when it comes to podcasting, mobile recording, video voiceovers, internet radio, conferences, and interviews. Another advantage of a USB microphone is that you can easily set them up by just plugging them into your computer's Universal Serial Bus port because no additional equipment is needed. Also, most use generic computer drivers such as MME drivers to work and as such, it is not necessary to install anything on your computer before using them. Even though Lapel mics are portable, they will still require connection to a transmitter and receiver as well as setting up the clip mic on the subject. The same is the case for XLR mics that may require a mixer or USB interface before they are fully functional. These are plug and play USB mics that do not require any of those, hence they are the easiest microphones to set up for podcasting, gaming, or vlogging and you can take them anywhere. 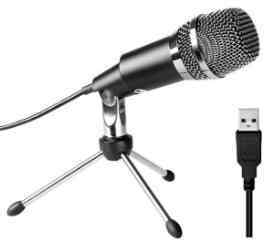 Due to the popularity of USB microphones, you'll find one from different manufacturers in different price ranges. Even if you have decided on a 100 dollars price range, it may still be difficult to find the best out there because these are generally inexpensive devices and most fall under this price range. How then can you tell one USB microphone apart from the other and determine its level of performance? One way that can be made possible is by following our review of the best USB microphones under $100 in 2018 which will enable you to choose a budget-friendly mic with a decent audio quality. 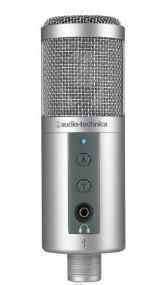 One of the most popular USB microphones under $100 is the Blue Snowball ice condenser microphone. Whether it's the 100 dollar price range, 200, 300, or even 500, you'll find this USB mic being listed as one of the best on several Amazon affiliate sites. Reasons being that customers love it and it has so much to offer despite its affordable price tag. The Blue Snowball ice condenser USB mic is designed and manufactured by the US based audio production company Blue Microphones. This is a company that also specializes in the manufacturing of headphones, signal processors, and music accessories and that has been so since 1995. Now, let's show you the Blue Snowball ice condenser specs. Available in either Black or White color, this is a USB mic with a solid build. It comes with an adjustable desktop mic stand to provide hands-free operation, hence you can place it in on a desk or in a corner while you work. Its lightweight of 1.68 pounds and dimension of 10.6 x 5.5 x 9.1 in makes it very portable which allows you to go anywhere with it. 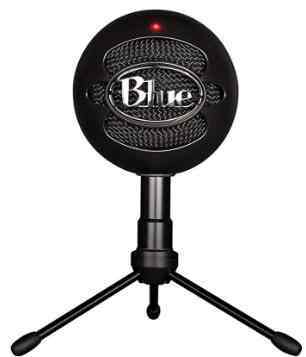 The Blue snowball ice is a type of condenser microphone that uses a Cardioid polar pattern to record sound. A condenser mic is more sensitive than a dynamic mic and as such, it can pick up even faint sounds. Coupled with that, its pickup pattern that is unidirectional makes it suitable for games, podcast, Skype, Twitch, YouTube, SoundCloud, and FaceTime or carrying out other activities that may only require one person at a time to use the mic. The resultant sound will be of high quality given the mic's high sensitivity to pick up a sound, but not in so many directions. As is the advantage of using these types of mics, this is a Plug and Play USB Microphone that only requires connection to a computer to become fully functional. That being the case, you do not have to install drivers to use it, as it makes use of your Mac or PC drivers. The frequency response of this USB 2.0 device is 40 –18 kHz which makes it suitable for a wide range of uses given this high recording resolution. The ability to add HD audio to recordings makes this mic a good alternative to the built mic of your computer, hence you can use it at home or the office. As long as you have a 64MB RAM computer running on either Windows OS (Windows 8, Windows 7, Windows Vista, XP Home Edition, XP Professional) or Macintosh (Mac OSX 10.4.6 or higher), you're good to go. The Audio-Technica ATR2500-USB price of about $79 and its features make it one of the best USB microphones in 2018. It should not come as a surprise that their USB microphone makes this list given the admirable DJ headphones, lavalier microphones for film and even record players we've seen from this brand. If you didn't know this already, Audio Technica is a Japanese company that specializes in the design and manufacturing of professional microphones, headphones, turntables, and other audio equipment. That has been the case since 1962. What does the ATR2500-USB mic offer? The ATR2500-USB comes with an LED light that shows if the mic is on or off, and it is packaged with a pivoting stand mount that can be placed on a desk. This stand is made of plastic, hence it may not really be durable given that some buyers on Amazon complained about it breaking down easily. The mic has a weight of 366 g (12.9 oz) and dimension of 155.0 mm long and 50.0 mm maximum body diameter. Considering this specs, it's still a portable device even though a bit on the chunky side. Like most USB mics, the ATR2500-USB is a Cardioid condenser USB microphone. It will tend to be highly sensitive to sound coming directly in front, fairly sensitive to those coming from the sides, and insensitive to those coming from the back. As a result, you can use it in a noisy place or open environment without worrying about audio quality being affected. Alternatively, if you have a really loud keyboard, it might still be able to pick up its sound as you type. While this mic is suitable for podcasting, if you'll rather have the background noise captured as well as in the case of being in a game or restaurant, then an omnidirectional USB mic might be more suitable. Use this mic for home studio recording, field recording, and voiceover and you can expect decent audio quality. Its analog-to-digital converter capability makes it easy to just plug it into a Windows or Mac computer without the need for an extra setup. To enable you to directly monitor the sound recorded, this device comes with a built-in headphone jack with zero latency recording. You can plug in one of your headphones into it to monitor the sound levels while you record simultaneously without any noticeable delays. This makes it suitable for live streaming when you expect the sound to be delivered immediately through the headphone as you speak. Much more, the easy-to-use up and down buttons on the microphone's front makes it possible you adjust the headphone volume even without using the controls on the headphone itself. Looking for one of the best portable USB microphones under 100 and even less than $50? 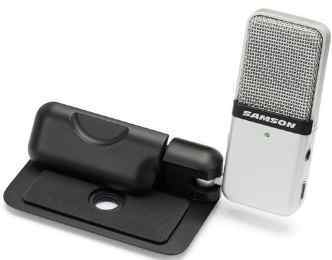 Then check out the Samson Go Mic Portable USB Condenser Microphone. The Samson Go Mic is designed and manufactured by the US company, Samson Technologies which has been in the wireless microphone technology business since 1980. If you've been wondering how good are USB microphones, then the specs of the Samson Go mic will tell you a lot. Amongst the five USB mics reviewed on our list, the Samson introduces Go Mic is the most portable. You can clip this unobtrusive USB mic to your laptop or place it on your desk while you use it to record to your computer. Its compact and small size makes it very easy to carry about and as such, you can even fit into a pocket if that's how you carry yours. You'll also find a USB cable, cable clip, and zipper carry case packaged with this cheap USB microphone. This is a portable USB condenser microphone that easily picks up sound especially when directed towards the mic. It has an enhanced frequency response of 20Hz - 18kHz resulting in decent audio quality, thus you can use it for recording music, podcasts, or for field recording. It is also ideal for Skype, voice recognition software, iChat, webcasting, and Voice over Internet Protocol (VoIP). The installation of drivers on a Windows or Mac PC is not required before you can use this USB mic since it automatically connects. Consequently, this is a Plug and play microphone that is easy to use. You don't have to settle for only one pick up pattern which the USB mic has been designed with as is the case with other mics. ThIS is because the Go mic enables you to switch between cardioid and omnidirectional polar patterns. If you're in a noisy place and would rather have only your voice recorded ( for instance while recording a podcast, acoustic guitar or vocals) then you can switch to the cardioid polar pattern. The same goes for the omnidirectional pattern which can be selected if you have multiple people speaking at a time, or you want to capture the entire room and record the surrounding sound as well. Connect your headset to the Stereo 1/8" headphone output made available on this USB mic and you can directly monitor your recordings in real time. There's even the Samson sound deck noise cancellation software that is compatible with Mac OS X and Windows which you can also purchase to use alongside this device. 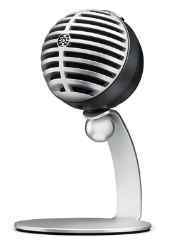 One more on this list which we'll also recommend, is the Fifine Technology K668 PC Microphone. The Fifine Technology K668 is designed and manufactured by the company Fifine that began in 2009 and now has products in the US, UK, CA and Japan. If you're used to the design of conventional microphones, then here's a USB mic that has retained the same design. Also, this mic comes with its own stand to enable you to record with ease without the need to adjust it frequently. The Fifine K668 pc microphone is a type of condenser mic that is highly sensitive to sound. This is a USB microphone for PC, Macbook air, and Chromebook that can be used for Google Voice Search, YouTube, vocals, video chatting, gaming, Skype etc. Since it does not require the installation of additional drivers on the computer before its use, you can easily plug this mic into the USB port and it'll become functional automatically. In comparison to the Blue Snowball ice and Audio Tecnica ATR2500-USB, this mic comes with an omnidirectional pickup pattern. Now, while this may not be suitable for use in a noisy place such as a live concert since it'll also record the environmental sound, it can be to your advantage if that's what you want. You can use it in an online meeting with several people in the room, record a group of musicians, and you can record with at a live football game where the excitement of the fans may be a necessary part of your audio. Its wide frequency response range of 50Hz-16KH makes for decent sound quality. You'll find a user manual packaged with this mic and directions on what to do if the mic suddenly stops working and doesn't pick up a sound. It may be the last on the list, but definitely not the least in terms of performance, so don't expect nothing less from this $99 USB microphone. Here's the Shure MV5 digital condenser microphone designed and manufactured by Shure Incorporated, an American company with ninety years of experience. This mic has been classified under their MOTIV Digital Microphones brand. A closer look at what it offers. The design of the Shure MV5 is unique and exceptional. This is a durable microphone that is available as Black with red foam and Gray with Black foam and as such, if you want a mic that looks a little bit fancy, this would be it. It comes with an anodized aluminum desktop stand to support the mic and provide a hands-free operation to handle other things. There's also an integrated thread mount that is compatible with any standard ¼" camera tripod thread. This is a digital condenser microphone that promises excellent audio quality given its enhanced frequency response and sound levels. Optionally, you can select between three DSP preset modes which are vocals, flat, and instrument which will allow you to capture your voice with clarity and even control your audio quality. This is another USB microphone with built-in headphone output to offer real-time monitoring. For this reason, you can speak, record, and listen to what's being recorded with a headphone without any latency delay. In terms of connectivity, you get a Micro-B-to-USB cable that will enable you to connect to a PC, Mac, or an Android device as well as a Micro-B-to-LTG cable to connect to Apple mobile devices. The minimum system requirement for its use is a 64GB RAM computer either running on the Windows OS (Windows 7 or Windows 8) or Macintosh (OSX Lion 10.7, OSX Mountain Lion 10.8, OSX Mavericks 10.9, or OSX Yosemite 10.10). This is a USB microphone for iPhone 5, 5c, 5s, 6, 6 Plus; iPod Touch 5th generation; iPad 4th generation, iPad Air, and iPad. It can also be used on Android devices that support USB Audio Class 2.0 and Micro-B OTG. Thus, its use is not limited to a computer or Tablet, since you can also use it for most Android and iOS smartphones. How Were These USB Mics Selected? A number of factors can distinguish a great USB mic under 100 dollars from another ordinary mic in the same price range. That being the case, we had to focus on the major ones that will enable us to narrow down only to the best 5 in 2018. These factors also serve as the criteria for choosing the best USB microphone in 2018 which can provide an acceptable level of performance. Price was the major determinant in which USB microphones we went for. Thus, our selected microphones have a price range between $21 to $99 dollars. In line with this, if you're on a tight budget, you can find a device that'll meet your needs and the type of environment you intend using it with. USB microphones are generally portable devices, but that does not mean that there aren't some that weigh a whole lot and can't be moved around easily. Most of our selected devices have a solid build, but a compact and small size to make it easy to carry about if need be. A mic that covers a wide frequency response range will be able to handle lows, mids, and highs. These are mics that can handle low frequencies as well as high ones to ensure that the sound produced, is of an appreciable quality. One of the reasons most people will easily turn down USB mics is because of the inability to directly monitor the sound recorded in real time. But this is no longer the case given that modern USB microphones now come with headphone jacks to enable you to monitor the sound. In line with that, you'll find only the Blue Snowball Ice condenser Mic not featuring one because it has other specs to make up for it. As is usually the case of all the products we've reviewed, we also relied on the reviews and recommendations of buyers on Amazon for that particular product to determine its real-life operation. It may have admirable specs on paper and be manufactured by a reputable manufacturer, but it all boils down to its performance when it's finally handled. Thus, these are USB microphones on Amazon that have received a high number of positive reviews. Getting the best USB microphone under 100 that can offer excellent sound quality while standing the test of time is no longer a problem. These are devices that are compatible with PC, MAC, Tablet, as well as Android, and iOS smartphones. For the fact that they're inexpensive does not translate into a low-quality device since each can offer you excellent value for your money. On that note, add one of these to your audio equipment in order to improve the audio quality of your videos. Whether you are in the UK, US, Australia as with several other countries, you can purchase these USB microphones directly from Amazon or eBay and Walmart.